Directed Studio Practice | Metalwerx, Inc. This is an opportunity for students to work on independent projects with questions and guidance offered by a professional. Finish up projects hiding in your bench. Get advice and delve into those designs swirling around in your head. This class is loaded with great bench tips to guide students through projects with success. Students discuss and critique designs one-on-one with the instructor, as well as in a group if desired. Technical demonstrations will respond to participants' interests and needs; soldering, wax working, and stone setting are among the many possibilities. David Baird has been making jewelry for nearly four decades. He received his bachelor's degree at the Evergreen State College, and his MFA from The School of the American Craftsman at Rochester Institute of Technology. He also has a GG (Graduate Gemology certificate) from the GIA. David sells his work nationally and has taught classes and workshops for at least 30 years around New England including Metalwerx, DeCordova Museum School, and Lexington Arts and Crafts Center. More recently he has been developing specialized jigs to make bench processes easier for his students. The Directed Open Studio courses at Metalwerx are led by David because of his vast knowledge about the many facets of metalworking. Over the past 15 years, David has expanded his repertoire to include lapidary cabbing and carving. He now devotes his time between two studios, both lapidary and jewelry, taking on commissions by request. 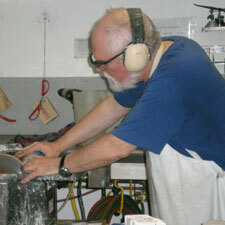 His studio is located at the Waltham Mill Buildings, near Metalwerx where still he teaches regularly. Tools and equipment are available to use during class but there is no materials fee. Supplies for projects are provided by students but the instructor is happy to offer guidance before ordering. Students should bring their favorite hand tools to class, but are welcome to use Metalwerx's wide array of tools and equipment.